Edsim++ is an object oriented visual PKPD modeling tool. Its elegant and innovative user interface makes the software extremely simple to use so that it is well suited for teaching pharmacokinetics. Edsim++ is equipped with a large extendable library of advanced PKPD objects that can be used for building complex models as required in a research environment. PKPD processes are represented by objects which can be connected to each other. Models can be reused with the MwPharm++ application for use in TDM. Edsim++ employs the concept of object oriented modeling. PKPD processes are represented by objects that can be dragged upon the desktop, after which the objects can be connected to each other. Double clicking an object expands the object properties window giving access to the details of the object (constants, parameters, variables, observations, events, etc). Objects are categorized into compartments, inputs, outputs, transfers, effects, and tools. All object parameters have default parameters so that a constructed model can be simulated directly without having to enter numerous parameter values first. Model parameters can be fitted to variable observations. Alternatively, model parameters can be randomized in Monte Carlo Simulations. Model diagrams can be exported as Microsoft Visio diagrams (VDX). Simulation output data can be saved as Microsoft Excel workbooks (XLS). 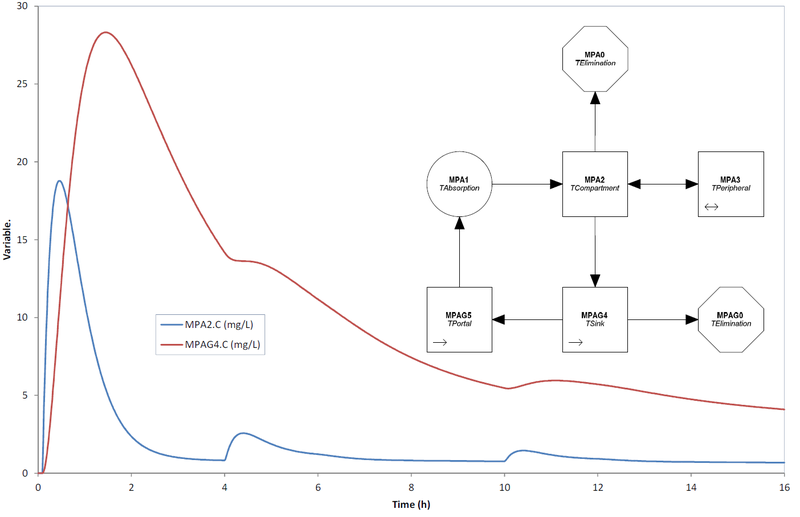 Models can be reused with the new MwPharm++ application for use in therapeutic drug monitoring (TDM). Mycophenolic acid (MPA) is an immunosuppressant drug used to prevent rejection in organ transplantation. MPA is administered orally (typically 500 mg per 12 hours). The prodrug MMF (mycophenolate mofetil ester) is also given because of improved bioavailability. MMF is rapidly hydrolized to MPA by esterases (plasma, liver, and kidney). MPA shows 2-compartment kinetics. Only a minor fraction of MPA is eliminated renally. The major route of elimination is conjugation (mainly in the liver) to the glucoronide MPAG. A large fraction of MPAG is eliminated renally. A small but significant fraction is excreted into the bile. Emptying of the gall bladder into the gut is triggered by food intake. If this happens, MPAG is hydrolized to MPA, after which it is reabsorbed again from the gut. These events may show up as small secondary peaks in the MPA plasma profile. This phenomenon is called enterohepatic circulation (also known as enterohepatic cycle). 2-compartment MPA kinetics was modeled using a TCompartment object (MPA2) and a TPeripheral object (MPA3). First-order absorption is represented by a TAbsorption object (MPA1). Renal elimination of MPA and MPAG was modeled by two TElimination objects (MPA0 and MPAG0). Conjugation of MPA to MPAG was modeled using a TSink object (MPAG4). The key object in this model is the TPortal object (MPAG5) representing the gall bladder. A TPortal object accumulates drug from the connected source compartment just like a TSink object does (first-order transfer). In addition, a TPortal object can also deliver drug to a connected target object (also first-order transfer). What makes a TPortal object special is that this drug delivery can be switched on and off using an event schedule. In this example we simulated gall bladder emptying by adding two events to the MPAG5 object representing meal intake at 4 and 10 hours.